In anarchic nature of international politics, survival and self-preservation without being coerced by the adversary is the utmost desire of any state. To meet this desire, states form alliances and build military capabilities to ensure security of its national interests. Lessons from Cold War make the nuclear weapons as guarantor of security and survivability against conventional military threats and, therefore, have tremendously transformed the international politics. However, the proliferation of nuclear weapons poses an existential threat to humanity; as it may be acquired by rogue states and non state actors to endanger international peace and security. In this regard, Non Proliferation Regime (NPR) ceased the possibility with an obligation of disarmament to its signatories. Among several measures under NPR, the Non Proliferation Treaty (NPT) is the fundamental instrument to cap the spread of nuclear weapons, with 191 parties to the treaty, pledging for complete disarmament and peaceful use of nuclear technology. However, the P5 signatory states (USA, Russia, China, France, and Britain) have shown a cold response towards nuclear disarmament which hampers the spirit of NPT. On the other hand, four outliers (Pakistan, India, Israel, and North Korea) of NPT are unwilling to join the regime due to security reasons. Among these nuclear weapon states, the core motive to acquire the capability primarily revolves around security and prestige. However, there are some states who have the potential to build a nuclear weapon, either they have not opted for that path or voluntarily given up the very option. South Africa is the only state who has opted for nuclear exit voluntarily in 1990. Belarus, Kazakhstan, and Ukraine gave up the Soviet nuclear arsenals deployed into their territories and handed over to Russia. Along this road, advanced industrious nations like Australia, Switzerland, and Sweden have plans to go nuclear, but have not capitalized. Similarly, Brazil and Argentina abandoned their nuclear weapon programs at initial stages, whereas Iraq and Libya have been stopped by international measures. 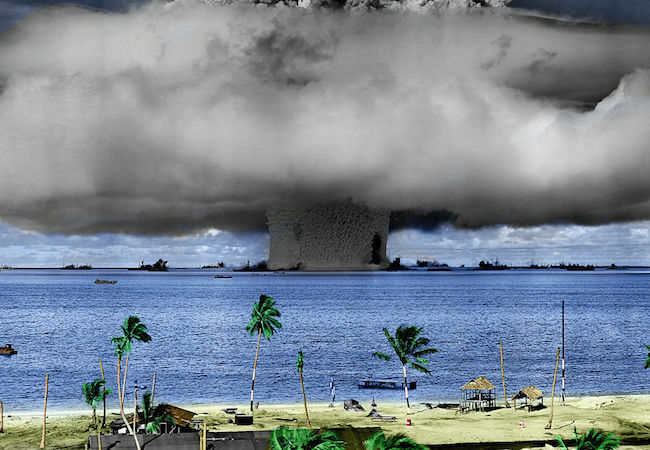 As we analyze the potential and stated need to build a nuclear weapon, only 72 states, according to IAEA estimates, have the potential to go for nuclear weapons. The potential is basically the existence of nuclear infrastructure for civilian use and can be diverted to weaponization. On the other hand, P5 NPT member states, along with 4 non NPT member states, have demonstrated their need based on security and prestige driven motives. Here arises many questions that how the disarmament will be achieved? How to end the discriminatory approachs of P5 NPT member states and, consciously consider their legal and moral obligation towards nuclear disarmament? And how the other 4 non NPT member states will agree to join the treaty? However, nuclear reduction must be carried out in hierarchal manner to set an example for the other 4 non NPT member states. President Obama’s Prague speech has given the possibility and enlightening hope that world without nuclear weapons is a way to thrive humanity. The pledge entails the responsibility to show deep cuts in their fissile stocks. For that purpose, the role of FMT and CTBT must be realized by those states who are adamant to ratify it, that will ultimately strengthen the non proliferation regime. Both US and Russia must remain on track to fulfill New START Treaty obligations to achieve the lowest level of warheads since 1950s. Spread of Peaceful Nuclear Energy must be incentivized for the entire world to feed the growing demands of electricity. The recent Iranian nuclear deal is a great success in this direction which denounces the urge for bomb and opens new avenues for civil nuclear cooperation. The role of IAEA is crucial as a verification regime to institutionalize the safe and secure spread of peaceful nuclear energy. As US and Russia take the lead in nuclear disarmament for the global peace and security, the other nuclear weapon states, with relatively smaller arsenals, will have to comply with and join the non-proliferation regime. Therefore, the world without nuclear weapons, as envisioned by President Obama is achievable, and demands adequate measures for its fulfillment. Those states that denounced the nuclear weapons and opted for civilian use of nuclear technology are the role model for the entire world and strengthens non-proliferation regime. Ar. Rehman is a graduate of National Defence University Islamabad with MSc in Strategic and Nuclear Studies. Areas of research include: Non Proliferation Regime, Arms Control & Disarmament, Diplomacy, Warfare, Missile & Space Programs, BMD, and Nuclear Strategy. Unrest in Kashmir: Why is India in no mood to resolve the explosive issue?